I’m a big fan of the Freakonomics podcasts, and the books/blog as well. I can barely wait a whole week in between episodes, and I’m always checking my TuneIn Radio app to see if there is an updated episode. Which, by the way, I wish TuneIn would let you subscribe for notifications when new episodes of my podcasts are posted. And why can’t I ‘favorite’ the Freakonomics podcast? Side note, I just read that the TuneIn Radio app and others like Pandora can sync with your car using MyFordSync. Unfortunately my wife’s 2012 Ford Focus isn’t yet supported, even though the 2013 model is. Anyway, I wanted to listen to another one of my favorite podcasts on my phone, the Breakaway podcast. But since I have an Android phone, I of course don’t have iTunes on my phone. And I wouldn’t want to anyway, as iTunes is far and Apple the most terrible product Apple has ever created (but we’ll leave that for another post). So I was trying to figure out how to listen to podcasts on my phone, and more critically, how to get the RSS link for the Breakaway podcast on iTunes. I use Podcast Addict. But to get the RSS url, that was a neat little trick. 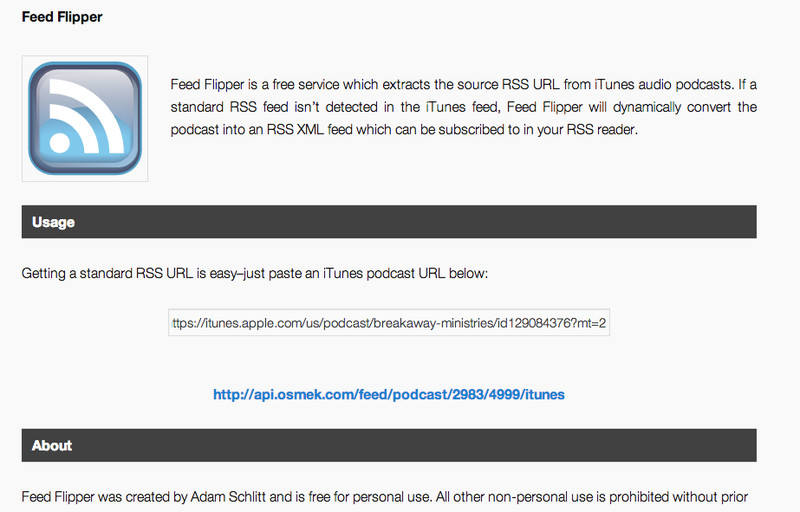 Adam Schlitt made a sweet free website that converts the iTunes link into an RSS feed link for you. Then the RSS link can be used to subscribe to the podcast in whatever non-iTunes software of your choice. Hope it was useful to you, and happy podcasting!